There are several designs available, I used a description of DH2PA for no particular reason (it was simply one of the first usable designs I found). If you don’t want to build it yourself, you can buy one on some radio stores or a local radio market. 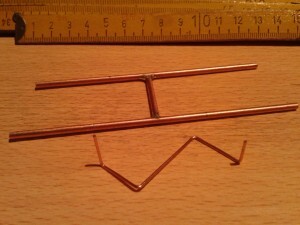 I used thick copper wire to build the antenna itself, and thin copper wire to create the match/feeder. Everything is simply soldered together. 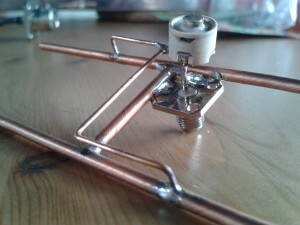 I used to build antennas for HF and VHF, so with these small dimensions I continuously thought I was building some model. The capacitor has a range of 2-6 pF and is used to match the antenna impendance. 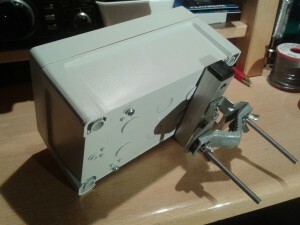 The antenna is a bit vulnerable to weather conditions and other external influences, so I put it into a plastic box. If you want to do this, remember that the box must be “RF friendly”. If you’re not sure, put the box into your microwave for 2 minutes along with a glass of water, the box should remain cold. 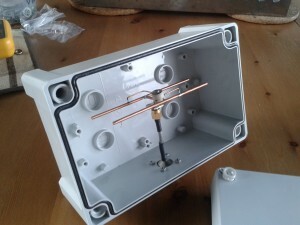 The antenna itself is fixed by using a small piece of semi-rigid, connected to the HB9CV at one side, and a N flange jack at the other side which is mounted through a hole in the box. 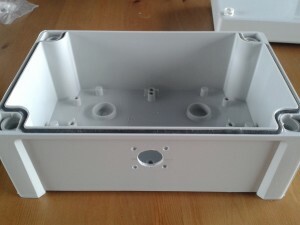 After a final test the box is mounted to one of my antenna poles, close to the LNC which I use to receive the 3cm output of the ATV repeater. 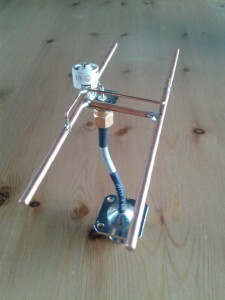 Down here you’ll see some pictures which show you how I made this antenna. The antenna itself is very small, so the construction needs to be very precise. Using copper wire makes it easy, you can simply solder all parts together, and with a metal file you can get the right measurements. The HB9CV is finished. The small tuning capacitor allows you to get a correct 50 ohm match. 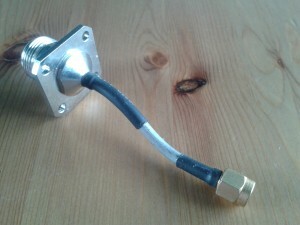 I found this thing on a radio market: a short piece of semi-rigid with a N- and SMA-connector. This is just what I need to put the HB9CV in a small box. The antenna is ready to be put in the box now. This is the box. I made a hole which will hold the N-connector. The antenna is in the box now. The N-connector is fastened with stainless bolts and nuts. To attach the box to the antenna pole, I used a clamp normally used to hold a small beam/yagi. 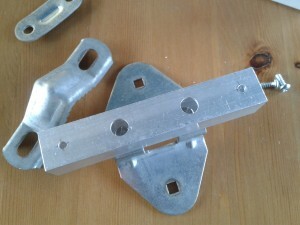 I fixed it on a piece of aluminium bar, which will be mounted to the rear side of the box. The antenna is ready to be mounted in one of my antenna poles. 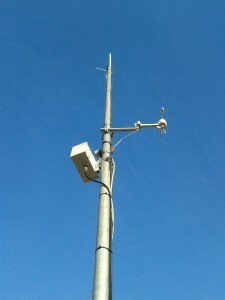 Another view of my pole, the other items are an Diamond X-50 (2m/70cm vertical) and the windmeter of my weather station. 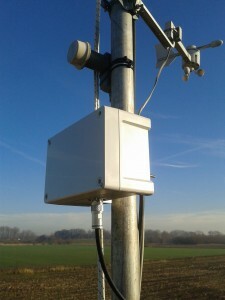 In hoeverre heeft inbouw in een (ABS) behuizing invloed op de verstemming van de antenne? I haven’t measured it yet (have no measurement gear for 1.3 GHz) but I tested the box in the microwave oven and it didn’t heat up at all. So I expect the influence is low to none. Can you supply the dimensions of the antenna elements and feedpoint matching element?